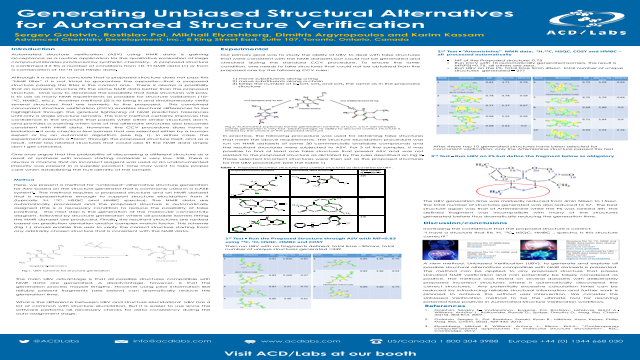 Abstract: Automated structure verification (ASV) using NMR data is gaining acceptance as a routine application for qualitative evaluation of large compound libraries produced by synthetic chemistry. A proposed structure is confirmed if it fits a number of conditions from 1D 1H NMR data  or from a combination of 1D-1H and HSQC data. Although it may be easy to eliminate proposed structures that do not meet filtering requirements, a more difficult task is to guarantee the structure, even when all filtering requirement are met – as there is always a possibility that an isomeric structure fits the same NMR data better than the proposed structure. One way to decrease the possibility that false structures will pass, is to use as many NMR experiments as possible for structure validation (1D-13C, HMBC, etc.). Another method  is to bring in and simultaneously verify several structures isomeric to the proposed. This concurrent structure verification enables structural differences to be highlighted through gradual tightening of NMR prediction tolerances until only a single structure remains. The spectral similarities of isomeric structures to the one proposed can mean that interpretation may be biased by the chemist’s expectations, and therefore result in false positives. Here we present a method for generating alternative ‘unbiased’ structures for ASV, based on the structure generator  used in a CASE system. Using this approach we are able to generate all isomers that fit a particular NMR dataset without using any prior available knowledge. Practical aspects of this ‘unbiased’ verification are discussed and several examples are shown. Summary: A new method, Unbiased Verification (UBV), to generate and explore all possible structural alternatives compatible with NMR datasets is presented. The method can be applied to any proposed structure that passes standard NMR verification and can potentially be falsely considered as positive. References: Golotvin, Sergey S., Vodopianov, Eugene, Pol, Rostislav, Lefebvre, Brent A., Williams, Antony J., Rutkowske, Randy D., Spitzer, Timothy D., Mag. Res. Chem. 45(10), 803-813, 2007. Golotvin, Sergey S., Pol, Rostislav, Sasaki, Ryan R., Nikitina, Asya, Keyes, Philip, Mag. Res. Chem. 50(6), 429-435, 2012.